A few years ago I had a customer who was looking for suzanis for a decoration project. We exchanged a few emails but she did not go forward with an order because she found suzanies from another store, which were washable. 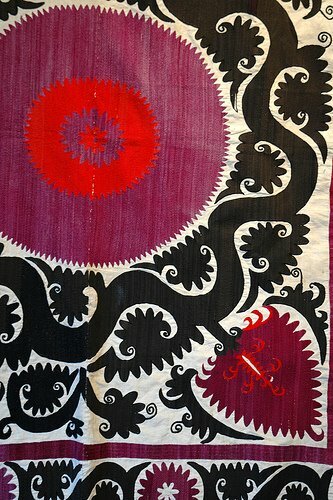 For those who are new to suzanis, just a quick definition info: suzani is a textile embroidery which is traditional to Central Asia, primarily to Uzbekistan, Tadjikistan and probably Afghanistan. Back in the old days and even now in remote villages, Uzbek girls were trained to embroider from an early age. By the time they were of a marriable age, they would have embroidered suzanies for their dowry. Suzanis are used as wall hangings, space dividers and bedspreads. Going back to a topic of washing, I will say that Uzbeks love color. When it comes to choosing threads for the embroidery, logic and practicality thoughts fly out of the window. The main focus is on choosing threads of beautiful colors! Quiet often there is a rainbow of threads from different shops, which work beautifully together color-wise but … come from different manufacturers and may or may not be colorfast. Now knowing what I just told you, imagine you decide to wash a suzani, what will happen? Some threads will bleed, other will not, but the suzani will be ruined forever! This is why when you hear about washable suzanis, please ask the vendor to wash it in your presence. Please also drop me a line if you like the “after” product. I personally have never heard of anyone washing suzani though i have come across vendors who claim that their suzanis are washable. © 2002 - 2018 UzbekAlive. All Rights Reserved.